What can you expect from EduEval in 2016? EduEval has evolved over the years since its inception in 2010. We have enjoyed working closely with governments, private school operators, NGOs and corporate partners to help support evidence-informed decision making in the education sector. We are excited that we have been able to grow in the MENA region. Our growth is a recognition that there is a need for high quality consulting for all stakeholders who want better education for a knowledge-based society. As we have grown, we do need to make sure that we continue to meet the needs of the community that engages with us. So we have made a few changes and we are working on a few exciting internal projects to share with you. So what can you expect from us in 2016? We will be changing our name from EduEval Educational Consultancy to EduEval! This represents our organic growth as we have built several verticals where we will continue to promote the same level of excellence in evidence-informed decision making on a broader scale. We are working on a School Choice Guide for parents in Dubai. We have been approached by several parents and concerned stakeholders over the years. Parents who need help in understanding how to make the best decision for their child when it comes to choosing a private school in Dubai. This guide will be available soon – so keep your eyes on us. We will be publishing more on understanding the practical link between assessment for learning, the role of technology and promoting better teaching and learning. So follow us on twitter and you will notice more activity sharing relevant information about education. We will be directly engaging with communities to promote our new initiative: Industry Connect. This is a great series of programs that are being developed with corporate partners and schools to promote a greater link between the theoretical learning in schools and real-wold applications. We will continue our commitment to excellence by relying on assessment, monitoring, evaluation and research to make informed decisions that promote the best practices in education in the MENA region. Thank you for all of your support over the years of our infancy. We appreciate all of our followers, our partners, our clients. We also appreciate the time from the students, parents, teachers, school leaders, and high level bureaucrats who have given us their trust and engaged with EduEval. We have received many accolades and statements of gratitude from our stakeholders. Each of these positive reflections have meant a great deal to all of the professionals who have worked tirelessly to ensure a high quality service since we started this company. From the EduEval family, we wish you a wonderful new year and lets make 2016 one where we can focus on cultivating motivated confident happy young independent 21st century learners. The third What Works event and first in 2015 was held on the 19th of January. Educational professionals from all over Dubai private schools came together to exchange their best practices on teaching, learning and leadership in schools. This series also included the signature workshops dedicated to professional knowledge sharing for school leaders where a key talking point was the challenge to meet the National Agenda 2021 and Dubai Plan 2021. Schools are being asked to improve student achievement and improve Dubai’s ranking on international tests. Private school leaders are taking this tall order from HH Sheikh Mohammed bin Rashid Al Maktoum very seriously. The message is clear, residents of Dubai should be assured that their kids are in schools that are one of the best in the world! With this demand hanging in the Dubai air; it was only natural that What Works dedicates a series of leadership workshops on school self-evaluation where school leaders exchange their expertise to promote systemic measurable school improvement. 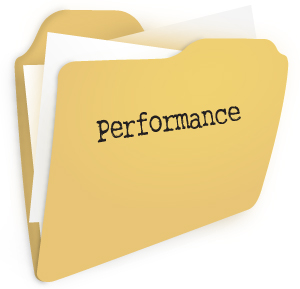 At this particular event in January, there was a focus on the practical coupling of performance management and school vision. Effective educational leaders help their schools to develop or endorse visions that embody the best thinking about teaching and learning. How they reflect the needs of their school in the school vision? How they make the vision operational in daily practice across the school? There is no scarcity of literature on the galvanizing effect of a progressive school vision that is well implemented. Moreover, a quick visit to most Dubai private schools will show that vision statements are a dime a dozen boasting laudable goals of whole student development, 21st century skills and the fostering of life-long learners. So why all the attention on school vision and performance management? This audience took progressive school vision a step further. They talked about the alignment of school-based outcomes and the vision with an explicit purpose: the daily practices in their schools should result in desired outcomes. This is a shift from static leader-driven visions to a shared vision that promotes a learning organization. This meant a few tweaks in how some leaders were thinking about their school vision. Yes, it is good to consider the desired outcome when creating a vision. But, it is also necessary to consider the evidence of the current context using data collected from various sources such as assessment results, staff an d student attendance rates, staff turnover rates, disciplinary incidents, parental surveys, and student questionnaires. These data can be utilized to develop evidence-based strategies for a vision that moves schools from the abstract to the real – in other words, from traditional goals to progressive goals using a SMART framework. Progressive goals that will support an actionable school improvement plan to get the most out of the school vision. The school choice debate often addresses contentious issues that bring a number of emotional arguments to the surface. Often, arguments that reflect core values of education for all and individual rights are juxtaposed. Advocates for school choice talk about the individual right to choose and market-based quality assurances. Advocates for public school talk about public good, national development and equity. The arguments are – of course – more complicated and controversial. But, in these arguments, access to school is assumed – even if the quality of the schooling is questionable. For example, most of the debate is now focused on “emerging public school alternatives” such as voucher programs and charter schools that shift resources and promote competition. So what happens in a place where private school choice and competition is the default? If you want to learn about real school choice – then Dubai is the learning ground. In Dubai, schools are private and diverse because school choice is the default for the majority expatriate population – there is no public school option. Sounds like a haven for school choice advocates promoting market accountability as the answer to public school problems. However, like any educational landscape, a fully private system also bears the reality of practical issues. Over the last year, an interesting case has emerged in Dubai. Gems, the largest education provider announced its intention to close a 17-year-old school (17 years in Dubai is established!). Gems claimed it could not continue to operate at the same quality for the same fees. In fact, it claims it can’t possibly offer a minimum quality for under AED15,000 ($4,000). But the government regulations prohibited the desired fee hike of 50%. Interestingly, the media did not report on parental concerns about a hike from AED10K to AED15K! The media reported on parents concerned about finding any schools with similar quality within the same “fee bracket.” In fact, according to the media, parents wanted to pay more in the face of school closure. For the last five years, we have been sustaining our old schools by compromising on quality. Currently, there are fee-hike negotiations being made to keep this large school open. But more school closures are threatened and parents are at a loss because the choices are not there! The growth rate of Dubai is simply outpacing the growth rate of good schools. This example puts a spotlight on the circumstances that pro-choice advocates do not consider as they insist on the benefits of competition to promote quality overall. How to ensure the minimum standard is respected? How to address corporate approaches to un-welcomed regulations? How to regulate for consumer protection without compromising school operator rights? The only certainty is that Dubai can offer a new depth of insights into the school choice debate! Earlier this week EduEval was invited participate in the 2nd HCT Research Symposium: Building Networks for Research and Publishing. Dr. Christina Gitsaki, former UNESCO Chair in Applied Research in Education organized the event that focused on the practicality of conducting relevant educational research in the region … and how to connect it globally. The conversations revolved around what kind of applied research would be helpful in the GCC, the role of the academic community and the practical nitty-gritty of conducing successful applied research projects from start to finish. As the day progressed, there were many questions about the impact of various programs and interventions. For example, there was a long discussion about the real effect of i-pads classroom use on teacher efficacy? on student motivation? on student learning? and on student achievement? As faculty and researchers discussed ideas, they also reflected on the Trends in International Mathematics and Science Study (TIMSS) data for Dubai. 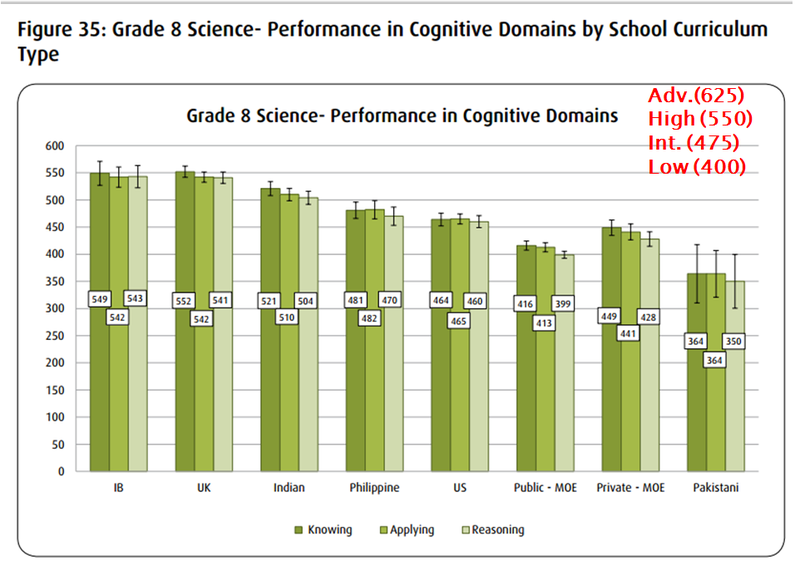 Pulling from the TIMSS 2011 Science 8 results for the Cognitive Domains (Knowledge, Application, and Reasoning). Dubai was the only jurisdiction in the GCC (who participated in the international test) that – on average – reached the intermediate benchmark. As we questioned why this was the case, the KHDA report was helpful in shedding some light on these results. The figure below taken from the KHDA report shows that when the data is redistributed by school curriculum type, only the IB, UK, and Indian and Philippine schools reach the intermediate level (on average). Sadly, the Pakistani schools are not even reaching the low benchmark. As the day progressed, assumptions and perceived problems were turned into hypotheses and research questions. There was a focus on how to examine the issues identified by data and how to understand the effect of different solutions in different contexts. The call for professional learning opportunities on how to conduct applied research in the region is getting louder among the education community. Last month, the Gulf Comparative Education Society offered a full day of pre-conference workshops addressing research ethics, writing good research proposals, research design, educational program evaluations, and data analyses. The interest on training for educational research in the GCC spans beyond its geographical borders. Last year in the UK, the Gulf Research Meeting offered workshops on The Impact of Large-Scale Datasets on Evidence-Based Educational Policymaking and Reform in the Gulf States. And in 2011, the International Development Evaluation Association offered workshops on evaluation practices in Amman, Jordan. Opportunities for professional learning in applied research are peppered in the GCC. There is a growing hunger among the academic and education community to develop their professional applied research skill set. This trend reflects the greater attention to results and concern for student learning and achievement in these times of major reforms.